Gift Display Box for Large Chains, Necklace or Pendants etc. Navy Blue finish Leatherette with Velveteen Pad insert including two Tabs to hold Necklace in place. Sizes 175mm x 100mm x 30mm. 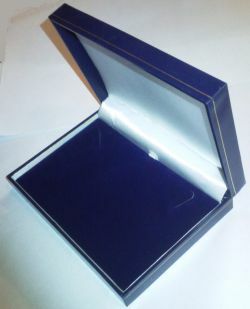 Large Dark Blue Necklace Gift Box with padded insert for displaying Necklaces and Chains. Details: Dark Navy Blue Leatherette finish, Velveteen Pad insert with Necklace Tabs.